The only place you would hold a wine glass with one hand and pet a cat with the other is in the comfort of your own home. Or in your Bond villain lair. That is, before the invention of the "cat bar." Currently seeking funding on Kickstarter, Denver Cat Company's cat bar would be the first of its kind in the US. And a cat bar is just what it sounds like: a place that serves alcohol where there's also a bunch of cats. 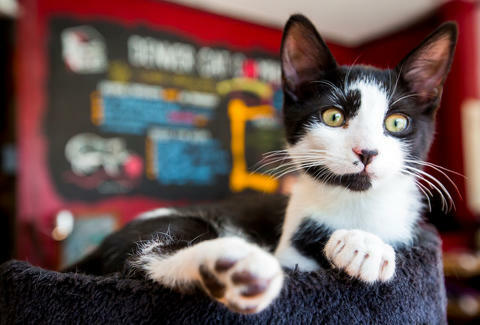 Since the Denver Cat Company is still in the stages of raising money, there's no word on when and exactly where in Denver this place will open. But, you can drop the project a few dollars and naturally speed things up by visiting the Kickstarter page. Kara King is a News Writer at Thrillist and a dog person. Send news tips to news@thrillist.com and follow her at @karatillie.